The Desired Effect is the second studio album by American singer-songwriter and The Killers frontman Brandon Flowers. It was released on May 15, 2015, by Island Records. It was produced by Ariel Rechtshaid and Flowers and mixed by Alan Moulder. The album debuted at number one on the UK Albums Chart, making it Flowers' sixth overall UK number-one record. In 2010, Flowers released his debut solo album Flamingo under the production work of Daniel Lanois, Stuart Price, and Brendan O'Brien. Flamingo, a homage to Flowers' hometown of Las Vegas, topped the UK Albums Chart and included a top-10 single on the UK Singles Chart. Flowers toured internationally in support of the album, receiving rave reviews for his live performances. Flowers then put his solo career on hiatus while he pursued collaborations with The Killers including the UK number-one album Battle Born. In February 2015, Flowers released a teaser video on his website as well as a hand written note stating, "May 18, 2015 We will finally achieve The Desired Effect. Ariel and I have been collaborating in the studio, working together in the spirit of conversation, contention, and at long last, Sweet contrition. No one has yet seen or heard the change. But soon, we all will." The Desired Effect was recorded primarily at The Killers' studio, Battle Born Studios in Winchester, Nevada. The album was produced by Ariel Rechtshaid and mixed by Alan Moulder. The album features notable musicians including Neil Tennant (Pet Shop Boys), Bruce Hornsby, Tony Levin (Peter Gabriel), Carlos Alomar (David Bowie), Joey Waronker (Beck), Kenny Aronoff (John Mellencamp), Ronnie Vannucci, Jr. (The Killers), Angel Deradoorian (Dirty Projectors), and Danielle Haim (Haim). "Can't Deny My Love" was released as the lead single on March 23, 2015. It also served as an instant download for pre-orders of the album. Flowers released a series of promotional video clips announcing the single. Flowers also released a series of promotional video clips announcing second single "Still Want You". He released the music video exclusively on Vessel.com A lyric video was released for "I Can Change". Flowers performed "Can't Deny My Love" on The Tonight Show Starring Jimmy Fallon on March 23, 2015. He performed both "Can't Deny My Love" and "Lonely Town" on Jimmy Kimmel Live! on May 7. On May 13, he appeared on The Late Late Show with James Corden to perform "Lonely Town". Two days later, on May 15, Flowers performed "I Can Change" on The Graham Norton Show. On May 20, Flowers performed a set at Maida Vale Studios on BBC Radio 2 Live Session with Jo Whiley; The Desired Effect was featured the record of the week (May 9) Flowers performed "Can't Deny My Love", "Lonely Town", and "Still Want You" on DirecTV's Guitar Center Sessions on May 29, hosted by Nic Harcourt. He performed "Still Want You" on the Strictly Come Dancing results show on November 15. In March 2015, Flowers announced a European leg of The Desired Effect Tour in promotion of the album. The leg began in Dublin, Ireland on May 19, and moved onto the UK starting in London on May 21. On tour Flowers was joined by guests on stage including Chrissie Hynde of The Pretenders and Bernard Sumner of New Order. In April 2015, Flowers announced a North American solo tour, which ran from July 27 through October 1. He also performed at the Austin City Limits Music Festival and at Life Is Beautiful. The Desired Effect received critical acclaim from music critics. At Metacritic, which assigns a normalized rating out of 100 to reviews from mainstream critics, the album received an average score of 75, based on 25 reviews. Matt Yates of Q wrote, "Big, bold and joyful, it's exactly what a great pop album should be." Neil McCormick of The Sunday Telegraph called it a "set of perfectly honed pop-rock burnished with immense choruses" and wrote that, "every track offers up a smart blend of snappy lyrics and catchy hooks." Mark Beaumont of NME wrote, "The Desired Effect is a consistently impressive collection." Sarah Jamieson of DIY wrote "Brandon is still very much the star of this show... he's always been at his most comfortable creating huge pop songs and with his last solo effort, he proved to do just that." Andy Gill of The Independent called it "a series of huge-sounding, stadium-ready pop anthems of undeniable charm." Lewis Corner of Digital Spy called it, "an astute and vivid record." Sarah Rodman of The Boston Globe wrote, "The other predicted effect of the album? A desire to play it repeatedly." Darryl Sterdan of The Observer wrote, "Worth your time." Rob Sheffield of Rolling Stone wrote, "The Desired Effect is something rare—the best straight-up pop album made by a rock star in recent memory." The album won the 2015 AML Award in the "Lyrics" category. The Desired Effect debuted at number one on the UK Albums Chart with first week sales of 31,077 copies, making it Flowers' second solo number one album and sixth overall, including work by the Killers. In the United States, the album sold the seventh most copies its debut week, but due to the inclusion of streaming data, it charted at number 17. At the mid-year mark, the album was the 38th best-selling album of the year in the UK. Single "I Can Change" charted on the UK Singles and Irish Singles charts. Singles "Can't Deny My Love" and "Lonely Town" charted on the US Hot Rock Songs chart. The album was certified Gold by the BPI in April 2017. All tracks produced by Ariel Rechtshaid, except "The Way It's Always Been" produced by Brandon Flowers and "Between Me and You" produced by Robert Root. 2. "Can't Deny My Love"
8. "Never Get You Right"
10. "The Way It's Always Been"
"I Can Change" contains an interpolation from "Smalltown Boy" (1984), as performed by Bronski Beat. Credits adapted from the liner notes of The Desired Effect. ^ a b McCormick, Neil (May 9, 2015). "Brandon Flowers, The Desired Effect, review: 'perfectly honed pop-rock'". The Daily Telegraph. ^ a b Phil Mongredien. "Brandon Flowers: The Desired Effect review – thrillingly 80s-style pop". The Guardian. ^ Lindsay, Cam (May 15, 2015). "Brandon Flowers – The Desired Effect". Exclaim!. Retrieved June 4, 2016. ^ a b c Gill, Andy (May 15, 2015). "Brandon Flowers, The Desired Effect – album review: Huge-sounding pop anthems with a spiritual side". The Independent. London. ^ a b c "Brandon Flowers Will Achieve 'The Desired Effect' on New Solo Album". Rolling Stone. ^ "The 15 Best Shows of the Summer". Spin. ^ "Brandon Flowers Plots Tour Dates". Spin. ^ "The Killers notch up fourth UK Number 1 album with Battle Born". Official Charts Company. ^ "Brandon Flowers Used a Neil Tennant Voicemail Message on a New Song". Billboard. ^ Andrew Trendell. "Danielle Haim, Neil Tennant + more for Brandon Flowers' album". Gigwise. ^ CDML #1. YouTube. March 2, 2015. ^ CDML #2. YouTube. March 10, 2015. ^ CDML #3. YouTube. March 14, 2015. ^ CDML #4. YouTube. March 16, 2015. ^ CDML #6. YouTube. March 22, 2015. ^ VOX. YouTube. April 7, 2015. ^ DRUMS. YouTube. March 18, 2015. ^ KEYS. YouTube. February 20, 2015. ^ BASS. YouTube. March 12, 2015. ^ STRINGS. YouTube. April 9, 2015. ^ Rebecca Schiller. "Brandon Flowers unveils new video for 'Still Want You'". gigwise.com. ^ "Brandon Flowers Proclaims His Undying Love in 'Still Want You' Video". Spin. ^ Brandon Flowers – I Can Change (Lyric Video). YouTube. May 21, 2015. ^ "Brandon Flowers: Can't Deny My Love". NBC.com. Archived from the original on March 27, 2015. ^ "Jimmy Kimmel Live : Jason Schwartzman, Hailee Steinfeld, Music from Brandon Flowers Watch Full Episode – 05/07/2015". ABC. ^ Brandon Flowers: Lonely Town. YouTube. May 14, 2015. ^ "BBC One – The Graham Norton Show, Series 17, Episode 6". BBC. ^ "BBC Radio 2 – Jo Whiley, Brandon Flowers in Session". BBC. ^ "BBC 2 – Playlist". Radio 2. ^ Stephens, Hannah Verdier Heidi (November 15, 2015). "Strictly Come Dancing 2015: week eight – as it happened". The Guardian. Retrieved October 2, 2016. ^ "Watch Chrissie Hynde and Brandon Flowers Perform Together". Rolling Stone. ^ "Watch Brandon Flowers, Bernard Sumner Play New Order Classic". Rolling Stone. ^ "Brandon Flowers 2015 North American Solo Tour Schedule". April 27, 2015. Retrieved May 4, 2015. ^ "Brandon Flowers Announces 2015 Solo Tour Dates". April 20, 2015. Retrieved May 4, 2015. ^ "Brandon Flowers Announces North American Solo Tour". April 21, 2015. Retrieved May 4, 2015. ^ a b "Reviews for The Desired Effect". Metacritic. Retrieved May 13, 2015. ^ Collar, Matt (May 18, 2015). "The Desired Effect – Brandon Flowers". AllMusic. Retrieved May 18, 2015. ^ Kyle Anderson (May 14, 2015). "The Desired Effect by Brandon Flowers: EW review". EW.com. Retrieved May 14, 2015. ^ "Brandon Flowers: The Desired Effect". Pitchfork. Retrieved November 20, 2017. ^ Rob Sheffield. "The Desired Effect by Brandon Flowers | Rolling Stone Music | Music Reviews". Rolling Stone. Retrieved May 19, 2015. ^ Soto, Alfred (May 19, 2015). "Review: Brandon Flowers Ascends Toward True Thob n' Moan on 'The Desired Effect'". Spin. New York. Retrieved May 19, 2015. ^ Neil McCormick (May 9, 2015). "Brandon Flowers, The Desired Effect, review: 'perfectly honed pop-rock'". Telegraph.co.uk. London. ^ Mark Beaumont (May 1, 2015). "NME Reviews – Brandon Flowers – 'The Desired Effect'". NME. ^ "Brandon Flowers – The Desired Effect". DIY. ^ "Brandon Flowers: The Desired Effect album review – An astute and vivid record". Digital Spy. 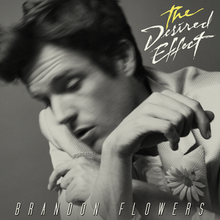 ^ "CD review: Brandon Flowers, 'The Desired Effect'". The Boston Globe. ^ "Flowers, Weller top this week's new music". Sarnia Observer. ^ "Brandon Flowers's New Album: The Desired Effect". Rolling Stone. ^ Hall, Andrew (February 4, 2016). "2015 AML Awards Finalists #4: Lyrics, Picture Book, and Poetry". Association for Mormon Letters. Retrieved February 4, 2016. ^ "Albums of the (half) year". Daily Herald. ^ DIYMAG.COM. "THE DIY LIST 2015: THE YEAR IN MUSIC". DIYMAG.COM. ^ gigwise.com. "Gigwise's Albums of the Year". gigwise.com. ^ "2015's Best Albums: Idolator Editors Pick Their Favorite 15". Idolator. ^ LATIMES.COM. "Best of 2015: 10 Great Pop Albums from 2015". LATIMES.COM. ^ Yohana Desta, Tricia Gilbride and Chris Grasinger. "The 30 best albums of 2015". MASHABLE.COM. ^ NME.COM. "50 New Records You Need To Hear in 2015". NME.COM. ^ "Best Albums of 2015 (So Far!)". PopCrush. ^ "2015's top albums". The San Francisco Examiner. Retrieved October 2, 2016. ^ "The 25 Best Pop Albums of 2015". Spin. ^ "Brandon Flowers – The Desired Effect (Island/Virgin EMI)". Stereogum. ^ "Bizarre Awards 2015: Coldplay topple One Direction as group of the year". December 19, 2015. Retrieved October 2, 2016. ^ "The 10 best albums of 2015 (so far)". USA Today. ^ "Brandon Flowers' album has The Desired Effect on albums chart". officialcharts.com. ^ "The Top 40 Biggest Selling Albums of 2015 so far". officialcharts.com. ^ a b The Desired Effect (liner notes). Brandon Flowers. Island Records. 2015. B0022990-02. ^ "Australiancharts.com – Brandon Flowers – The Desired Effect". Hung Medien. Retrieved May 23, 2015. ^ "Austriancharts.at – Brandon Flowers – The Desired Effect" (in German). Hung Medien. Retrieved May 27, 2015. ^ "Ultratop.be – Brandon Flowers – The Desired Effect" (in Dutch). Hung Medien. Retrieved May 29, 2015. ^ "Ultratop.be – Brandon Flowers – The Desired Effect" (in French). Hung Medien. Retrieved May 29, 2015. ^ "Brandon Flowers Chart History (Canadian Albums)". Billboard. Retrieved July 14, 2015. ^ "Dutchcharts.nl – Brandon Flowers – The Desired Effect" (in Dutch). Hung Medien. Retrieved May 22, 2015. ^ "Offiziellecharts.de – Brandon Flowers – The Desired Effect" (in German). GfK Entertainment Charts. Retrieved January 23, 2018. ^ "GFK Chart-Track Albums: Week 21, 2015". Chart-Track. IRMA. Retrieved January 23, 2018. ^ "Italiancharts.com – Brandon Flowers – The Desired Effect". Hung Medien. Retrieved May 28, 2015. ^ AMPROFON [@Amprofon] (June 18, 2015). "The Desired Effect de @BrandonFlowers puesto #15 del #Top100MX del 18 al 24 de mayo #DIscoNuevo" (Tweet) (in Spanish). Retrieved June 22, 2015 – via Twitter. ^ "Charts.org.nz – Brandon Flowers – The Desired Effect". Hung Medien. Retrieved May 19, 2015. ^ "Norwegiancharts.com – Brandon Flowers – The Desired Effect". Hung Medien. Retrieved May 31, 2015. ^ "Official Scottish Albums Chart Top 100". Official Charts Company. Retrieved May 24, 2015. ^ "Spanishcharts.com – Brandon Flowers – The Desired Effect". Hung Medien. Retrieved May 31, 2015. ^ "Swisscharts.com – Brandon Flowers – The Desired Effect". Hung Medien. Retrieved May 31, 2015. ^ "Official Albums Chart Top 100". Official Charts Company. Retrieved May 24, 2015. ^ "Brandon Flowers Chart History (Billboard 200)". Billboard. Retrieved May 25, 2015. ^ "Brandon Flowers Chart History (Top Alternative Albums)". Billboard. Retrieved January 23, 2018. ^ "Brandon Flowers Chart History (Top Rock Albums)". Billboard. Retrieved January 23, 2018. ^ "End of Year Album Chart Top 100 – 2015". Official Charts Company. Retrieved April 29, 2016. ^ "British album certifications – Brandon Flowers – The Desired Effect". British Phonographic Industry. April 21, 2017. Select albums in the Format field. Select Gold in the Certification field. Type The Desired Effect in the "Search BPI Awards" field and then press Enter. This page was last edited on 19 February 2019, at 04:43 (UTC).